We're on the homestretch of Digit-al Dozen week! I think I say that every Thursday of DD week. But I always mean it. It's tough to knock out five themed manis in a week - shew! 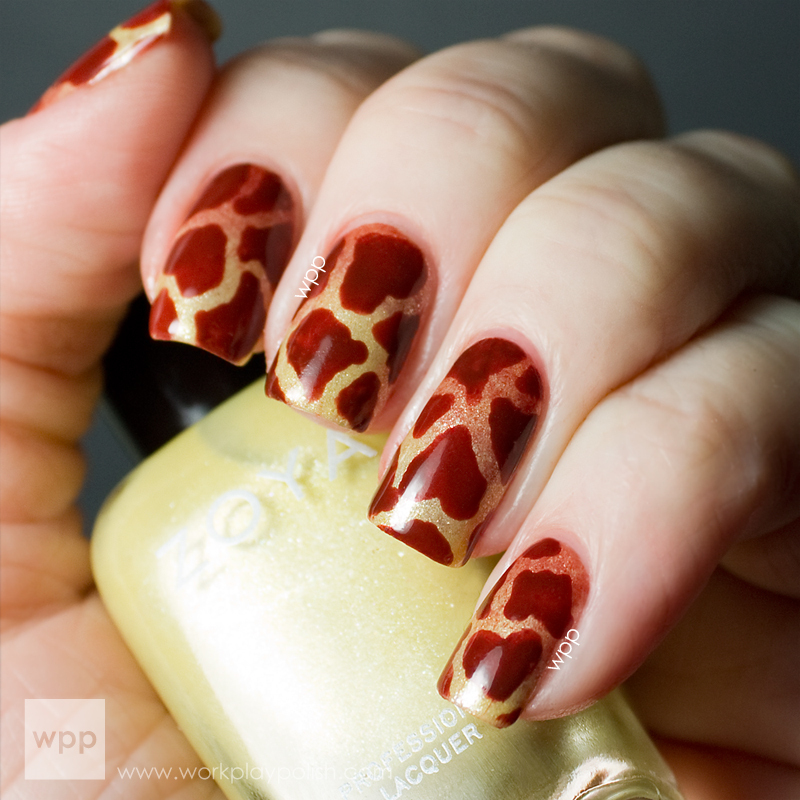 Today's animal mani has a gradient base with an easy dotted giraffe print. I used only two polishes, Zoya Piaf and Cola. I polished one full coat of Zoya Piaf over the entire nail. Piaf is a soft, shimmery yellow from the Spring 2013 Lovely Collection. I don't wear much yellow polish. This was a good excuse to free patient Piaf from the Mani Cave shelves! Next I did a light sponged gradient. I used a makeup sponge with a big stripe of Piaf and just a teeny stripe of Cola. Mimi at Makeup Withdrawal has great pics of this gradient technique. See her post here. After the gradient, I took a medium dotting tool and semi-randomly dotted on the spots. I say "semi-random" because I started with a heart shape on every nail. Can you see them? Actually the hearts helped me get started on the pattern. Try it! You'll see what I mean. But they're also kinda cute and undercover. Check out the other Digit-al Dozen animal posts! Lots of cool manis this week!